The Field Poll in California recently discovered that Senator Barbara Boxer’s reelection could be in danger if ethnic minorities did not turn out at the voting booths this November. That may come as a surprise for some people, but not for those who have seen and documented the growing power of the ethnic minority, especially the Latino vote, which catapulted Barack Obama and many other Democrats into office in 2008. Today, America’s Voice released a new report called “The Power of the Latino Vote in America: They Tipped Elections in 2008; Where Will they be in 2010?” Forty-eight pages long, it drills deep on Latino voting trends, how the issue of immigration reform will affect turnout, and also identifies up to 40 competitive races in 11 states (Arizona, California, Colorado, Florida, Illinois, Nevada, New Mexico, New York, Pennsylvania, Texas, Virginia) where Latinos are likely to make an impact this November. 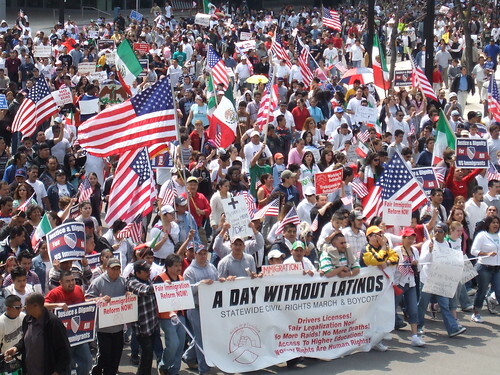 We have already seen how ignoring the Latino vote is hurting Democrats. Despite his restrictionist views on immigration, GOP candidate Scott Brown handily won the Hispanic vote in Massachusetts after Democrat Martha Coakley ran a questionable campaign that failed to outreach to the Latino community. Democrats are faced with a unique set of problems now: First, that their Latino base might not show up to vote this November and second, that even when Latinos do vote, no party can take this constituency for granted. This serves as another reason for Democrats like Barbara Boxer to become more responsive to the community and get moving on issues such as reforming the broken immigration system. Not doing so risks alienating Latino voters and depressing Latino voter turnout for the crucial 2010 elections. The message is simple: If Democrats want to retain their seats and not lose crucial seats in battleground states, they better start doing things that would bring their base out to vote. The GOP also has the opportunity to play a master-stroke and win the constituency for many years to come if it plays its cards right on issues like immigrant rights. Alas, the party has been hijacked by tea baggers and nativists in recent times who are calling for Jim-Crow era civics literacy tests. One thing is clear from this report: Both political parties can ignore Latinos and Latino issues at their own peril this November.